The property will be given to the city under a deal negotiated by the Kennebec Land Trust. AUGUSTA — Just a short walk into the woods from a number of informal access points scattered around Augusta and the edge of Hallowell, Howard Hill is a wooded world away from the bustle and noise of Maine’s capital city. But off an old logging road extending from Ganneston Drive to the top of the 164-acre undeveloped parcel, from the edge of a cliff where a pair of turkey vultures circled overhead on a recent day, the Capitol itself rises into view, the Maine State House’s dome presiding over a blanket of forest. The views afforded from the hill didn’t go unnoticed by publishing magnate William Howard Gannett, who in the 1890s bought some 450 acres including Howard Hill — where he created Ganneston Park. The park included gardens, ponds, carriage paths and trails he opened to the public so they could enjoy the natural setting as his family did in their log cabin lodge on the site, Camp Comfort, so named because Gannett was publisher of Comfort Magazine, the first American periodical to reach a circulation of more than a million. 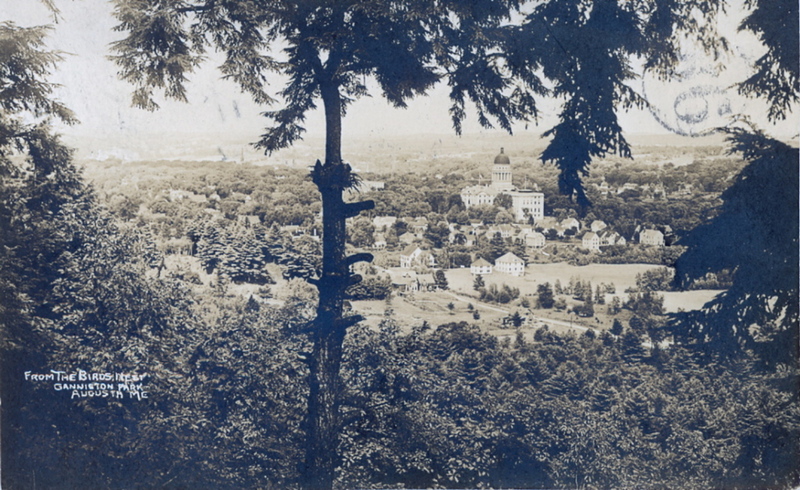 It’s a view that works in reverse, too, as the nearly unspoiled stretch of land provides a dramatic wooded backdrop behind the State House when viewed from the opposite side. Members of the Kennebec Land Trust, a local nonprofit land preservation organization, noticed both those views, too. It targeted the property for years before announcing last month it has a deal with the landowner to buy the property and turn it over to the city of Augusta. If all goes as planned, the property will be given to the city, along with a $100,000 fund to help care for it, and the land trust will retain a conservation easement that prevents the land from development. It will be open for recreation, wildlife-watching, and other nondevelopment uses. It is open to hunting now, and it will be up to city officials to decide whether to continue to allow that once the city takes ownership. City councilors voted unanimously Thursday to endorse the acquisition of the property, contingent on an agreement being struck with the land trust, and authorized City Manager William Bridgeo to act as a co-applicant with the land trust to seek Land for Maine’s Future grant funds to help make the purchase. The order approved by councilors stipulates that no local property tax dollars may be used to acquire Howard Hill. “Wow, this is beautiful,” Dale McCormick, at-large city councilor, said Friday during an informal tour of Howard Hill, which is named for Capt. James Howard, the first commander of Fort Western and Gannett’s great-great-grandfather. 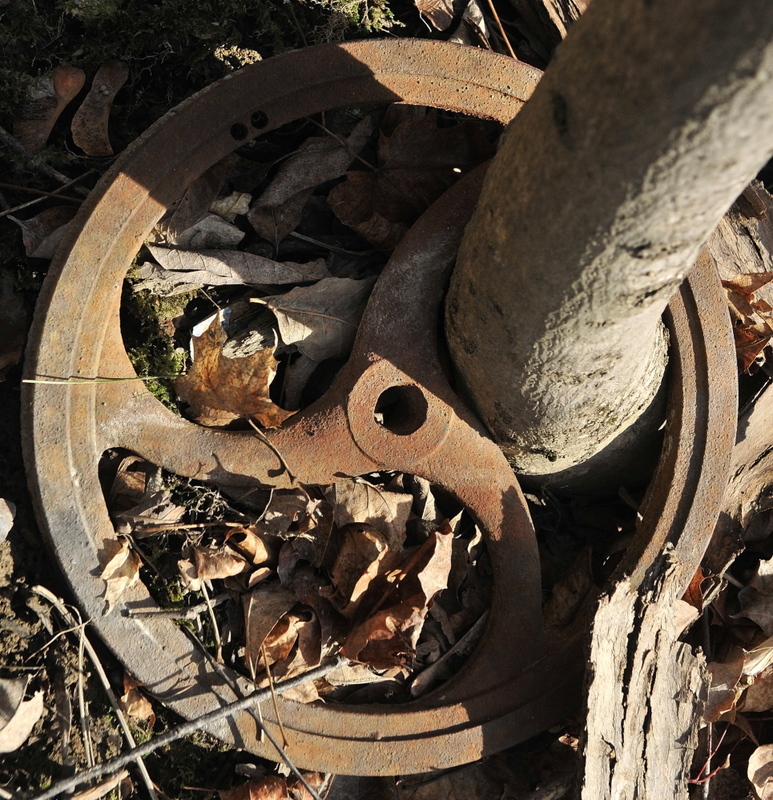 Brian Kent, president of the land trust, said the trust had eyed the property for years before reaching a deal with Augusta attorney Sumner Lipman, owner of the corporation that owns the land, to buy it from him by December 2015. He said the land trust saw it as particularly valuable to acquire and preserve in its natural state for several reasons: its scenic value; its location in the heart of the city, which makes it easily accessible; the green space it provides, which fits with Augusta Comprehensive Plan goals of increasing such areas; and the recreational, educational and wildlife-viewing opportunities it offers. 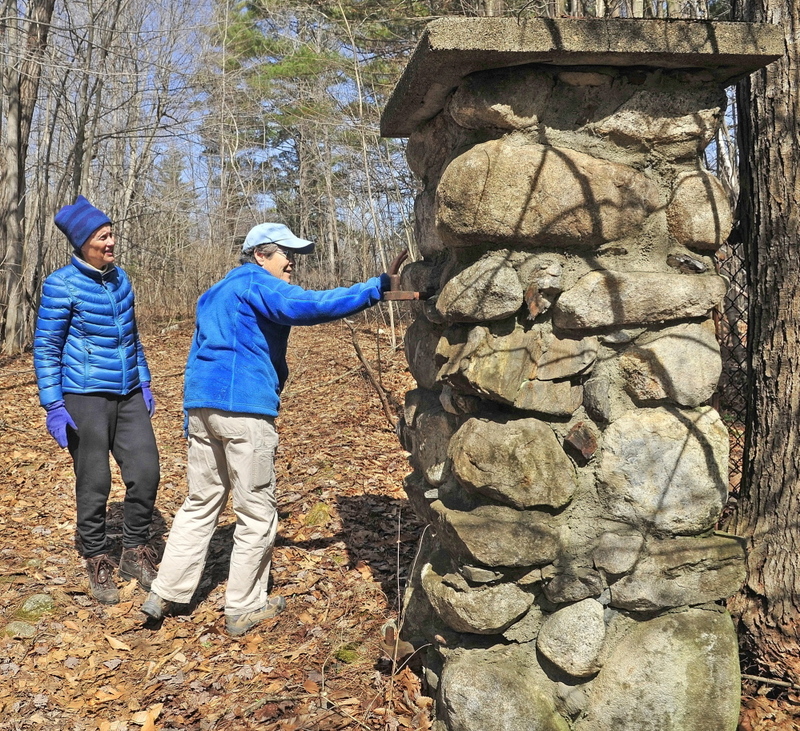 “To have the potential to conserve this is a once-in-a-lifetime opportunity,” said Sue Bell, of Augusta, a former state legislator and member of Kennebec Land Trust board of directors. She said the trust expects to close on the property in October 2015. City councilors and residents spoke in favor of the acquisition Thursday. The property is spread between a point just south of Capitol Street to the Hallowell line at the former Stevens School complex off Winthrop Street. 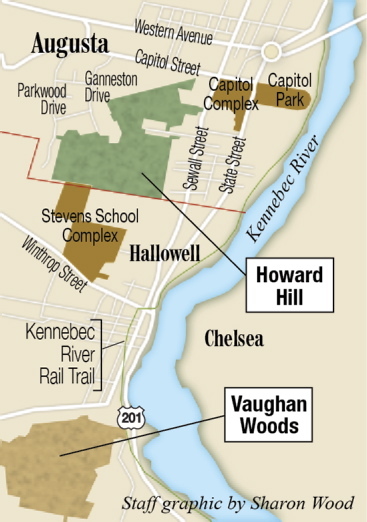 Informal hiking trails extend from the Stevens School site into and through Howard Hill. There are other unofficial access points off Sewall Street and Ganneston Drive. Councilor Michael Byron said he’s been contacted by a constituent who lives on Sewall Street who is concerned that access there could affect her privacy and solitude. 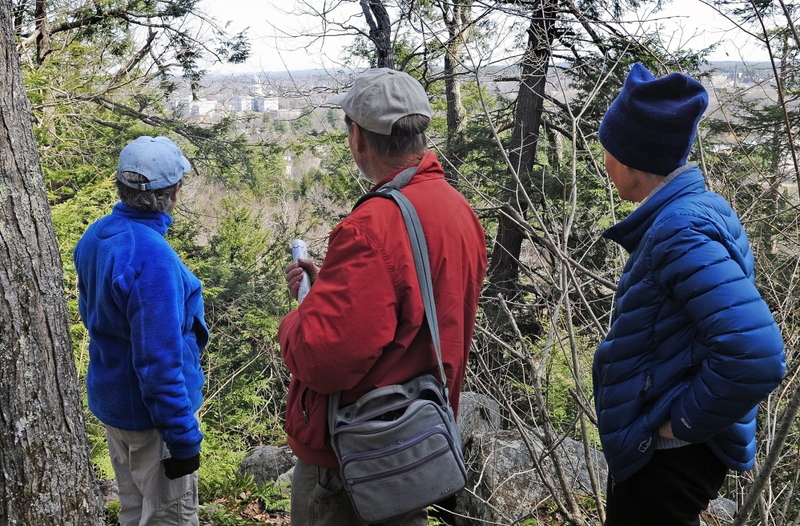 Mike Seitzinger, a board member of the land trust and president of Augusta Trails, a group that oversees other public trails in the city, said the city will own the land and will be able to decide how and where access to the property should be allowed. The Gannetts had a large, apparently cliff-side, treehouse on the property, though no signs of the treehouse remain. Kent said Gannett, whose son started Guy Gannett Communications, which owned the Kennebec Journal, Morning Sentinel, Portland Press Herald and several television stations until its 1998 sale, wanted to protect the natural features of the hilly, boulder-strewn land and allow the public to use it. While officials have not disclosed the proposed purchase price other than to say it is below market rate, Howard Lake, a Winthrop attorney and land trust board member, said the total cost of the project is about $1.5 million. The city’s property assessment database indicates three parcels that make it up, owned by Lipman, are valued at $171,000 for tax purposes. At the current property tax rate, the city would lose about $3,100 a year in annual taxes by taking the property. The land trust plans to seek grant funding and raise money privately, as part of its 25th-anniversary fundraising campaign, to purchase Howard Hill and provide the city with a $100,000 endowment to help the city manage the property once it takes it over. Donations may be made online to the Kennebec Land Trust, by calling the land trust at 377-2848 or mailing checks to Kennebec Land Trust at 331 Main Street, P.O. Box 261, Winthrop, ME 04364. Newspaper clips indicate the state sought to acquire the land in 1969 but didn’t go through with the proposed purchase of 190 acres for about $500,000. Wildlife seen on the property has included a moose and many deer, and the birch and beech trees, Kent said, provide good habitat for songbirds. Its many gullies provide plenty of quiet spots to get away from the nearby noise of the city.